One of the things many prospective buyers look for and homeowners want is a decent-sized car garage. Usually, not only for their cars, but as extra storage space. It’s also becoming a trend to get a double garage size with extra space for toys for the big boys, small machines and room for DIY projects. Car and storage space are just some of the few factors to consider when figuring out what garage size and garage door width you require. 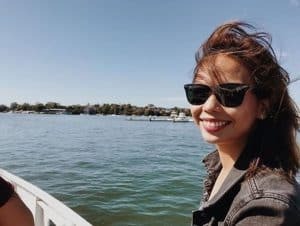 While it may sound easy, it actually causes overwhelming feelings for many when renovating homes or building a new one because of all the factors that need to be taken in and considered. Generally, in most newly built homes a single garage is smaller in length than a double garage. This is due to size constraints of the block of land the house is built on. The above information was taken from AS 2890.1 Section 5.4. *Warning gauges shall be provided for headroom with less than 2.3m clearance. Local council policy may alter these garage & carport sizes so be aware of that. However, in most cases they follow very similar to this table. The distance your garage of property can be from your boundary is dependent on your r-zoning and your council policies. 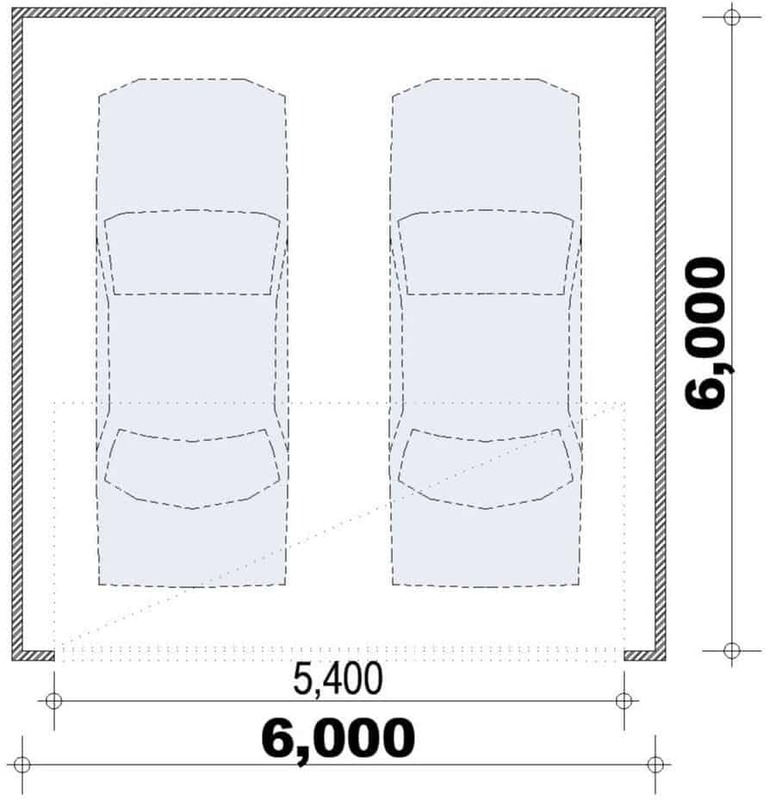 As a guide, a standard double garage dimensions should be around 6m x 6m with a door size around 5.2m. A standard single garage is around 3.6m x 6m with a door size around 2.6m wide. This will allow your cars to fit in comfortably and is a decent size for the majority of cars. How much Garage Size Do You Need? Because we want to make it easier for you, we’ve compiled a simple guide below to help you make that decision. This will allow you to think about what you will use your garage for and if it will fit your purpose. Do you own a sedan? Or do you have a bigger SUV you upgraded to to fit your family and space for prams and booster seats in? We’re asking because the size of your car and number of vehicles you own are the most important determining factors for your garage size and garage door width. Even with Australian Standards and council suggesting a garage door width to follow, the design will still depend on what you have and what you want to use the space for. If you’re a tradie and own a ute, or just a lover of rugged jeeps or 4WDs, your needs and your garage dimensions may change to accommodate your vehicle size and equipment that you have. As you can see from the table below, an average medium car is about 4.6m in length and 1.8m wide. *Sizes are estimated averages only for each category and do not match the example car given. Your garage size will depend on the block and free space you can work with, and what you’re going to use it for. If access is not a problem, you may want to consider a double or single garage in the backyard for an extra storage place. Even if you’re still not sure what you’re really going to use the garage for, this option can be convenient as it gives you more flexibility of changing the design and converting your garage for another use in the not-so-near future. Generally speaking, you’ll need at least 3.0 m x 5.4m of internal floor area for a single garage as a minimum. For bigger cars like an SUV, you may want to leave a bit more space so you won’t feel cramped and you’ll have extra room for storage purposes as well. If you’re building your garage from scratch and see yourself converting it to a living space soon, consider waterproofing and adding insulation as early as now so you can save on costs. Single or Double Size Garage? Now that you’ve figured out how much space you can work around with and what you’re planning to use your garage for, you now need to decide if you’re going for a single car garage size or a bigger one, if you have enough space to fit a double garage. A single car garage is the perfect choice if you own a sedan, hatchback, or a medium-sized SUV. 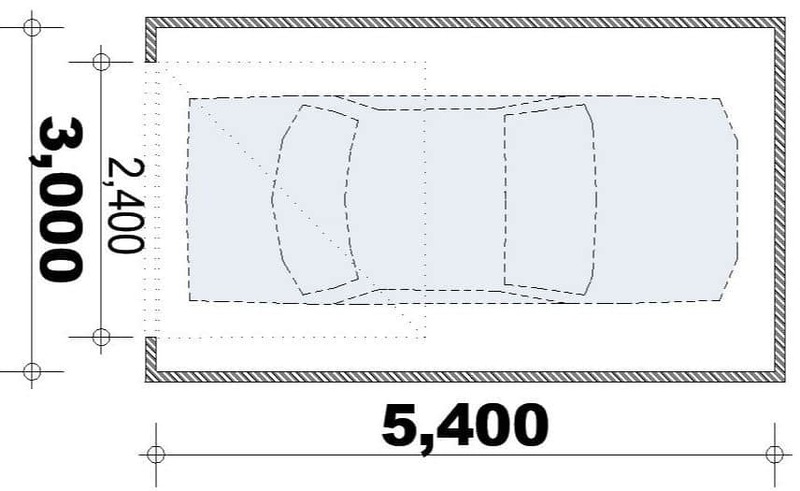 Below is an illustration of a minimum garage size for one car. Remember to allot enough car door clearance because of course, you’ll want enough space so you could adjust your parking (and avoid scratching your mirrors or side panels). If you have more than one car or just just think having extra space will be awesome, you can go for a double garage, space permitting. This requires more floor area because you’ll need at least 500mm space in between the two car spaces, giving you enough room to move around in. You can also choose between having a single door or two doors for your double garage. Just keep in mind that you should make your garage door width wide enough to fit two cars in and out of the garage without a hassle. If you are renovating and thinking of adding a garage or extending it, there are different options to choose from and they are listed below. If you are able to choose where you garage can go make sure the orientation doesn’t block sunlight into your house. In the majority of cases council building approval will be needed to erect these on your property in Australia. This is the easiest and cheapest garage extension as they can be bought as a DIY project from your local hardware store. It’s a popular choice for many renovations projects because it doesn’t cost much plus you don’t have to hire a contractor to do it for you. If you’re living in a country house or just have enough space for an extra garage, freestanding prefabricated garages are the best options because it’s easy, cheap, and versatile. These will usually be made out of a colorbond style material and look like a sturdy large shed. While this option’s more expensive because you will start from scratch and will need a builder and architect to achieve, a non-prefabricated freestanding garage gives you more freedom when it comes to design and choice of materials. This is your chance to build that garage of your dreams and you can design it in a way that it blends well with your house. Word of advice though, while this can still be a DIY project when it comes to planning and making drawings because it’ll be cheaper, it’s better to be on the safe side by hiring a contractor to make sure it complies with the standards and meets the requirements of your council. Additionally, in most cases engineering approval will be needed. Renovators and homeowners go for this option when they are prepared for a lot of work and expense to complete. Building a garage extension requires careful planning because there are more factors to consider, such as the structure and load-bearing of your home. Messing with these and doing the construction improperly will just cause more headache and expense for you. Thus, consulting a structural engineer is necessary. However, the silver lining to extending your garage is it adds more value to your home, which means more money for you should you decide to sell your home. Plus, with the ease of accessing your garage from inside your home, you can say goodbye to getting wet when it’s raining and just imagine how much easier it will be unloading the groceries from your car to your kitchen. In addition, the extra space can double as a storage area but it depends on the amount you are storing. Carport is the cheapest and easiest solution if you’re just after shade to store cars. Big hardware shops carry a wide range of DIY steel kits and it’s just up to you to make time to set it up. They will probably need engineering and council approval depending on the specifications. These are usually look like a more patio style and are generally open on all sides. Although there is a downside to this option: it offers little security because it’s just basically a roof covering your car. 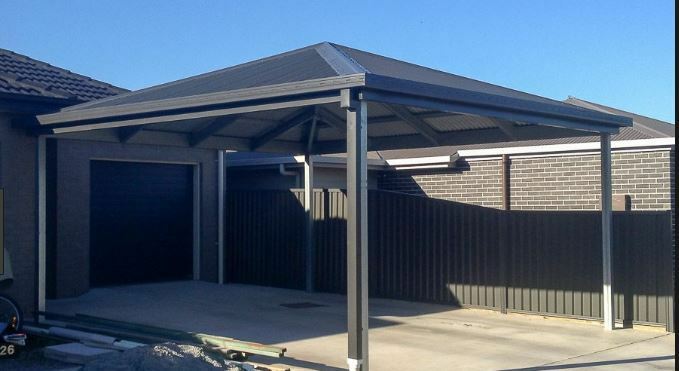 But if you look on the positive side of it, a carport can come in very handy during summer because let’s admit it, summer in Australia can be really hot. The minimum carport size for a single is 2.4m and for a double it is 4.8m wide. 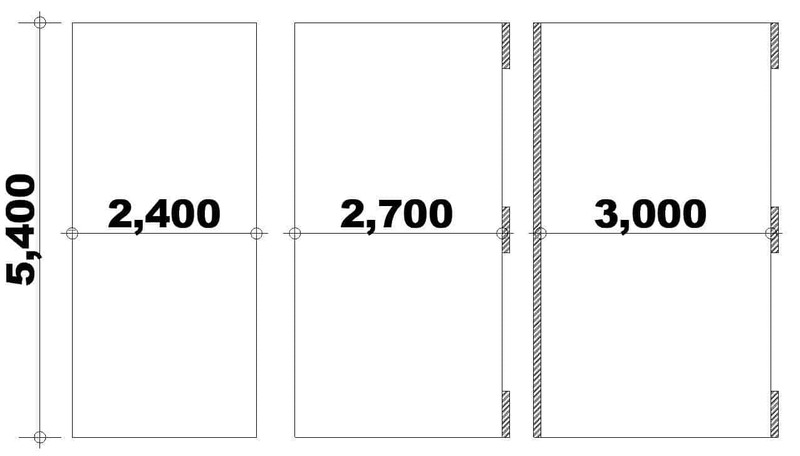 However, if the sides are enclosed it changes these minimums. Some images have been added below to show the sizes of single and double carports. These show the width of both based on if the sides of the structure is closed or not. If so, the extra 0.3m is required for door clearance. This second image shows a double carport minimum size with open sides, 1 closed side and 2 closed sides. As you can see 2 x 0.3m is needed for car door openings when the carport is closed on both sides. No matter which option you go for, keep in mind that your garage will sit on a concrete slab so you need to make sure you have enough space for it so you can make it thick and sturdy enough for support. You should also note that some suburbs have councils that regulate the appearance of your carport to make sure it won’t be an eyesore and will blend well with the surroundings. In addition, they set out certain setbacks from the property boundaries where you can build. So, before you even start planning, make sure that you know your council requirements so you’re not wasting time and money. There are also regulations and Australian Standards requirements that will affect your garage design and structure, especially if you have future plans of making it habitable. Regardless, as long as you arm yourself with knowledge and reliable contractors, you’ll be all good and there’s nothing to worry about. Is the standard for minimum sizes of garages actually legally binding? For example if I advertise a property as having space for two cars but the garage is bellow standard double garage minimum sizes as per the specifications am I putting false information in my advertising. Hey John, Im not a lawyer so i can’t tell you if its legally correct or not. If you are concerned get in touch with a lawyer they will be able to help. I know houses were build in the past that don’t comply with current Australian stds. So, you could research when the minimum size came in to play and then see if your house was build before that? We are a building broker. We provide you with a free price comparison of your plans from the top builders in Perth. Is CGI 3D Rendering Fooling New Home Buyers?